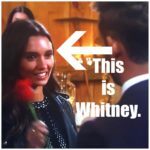 Did you see Part 1 of the this weeks Bachelor recap? Click HERE if you need all the deets on the 1:1 with Heather, they shocking exit of Elyse, and the group date in the jungle. 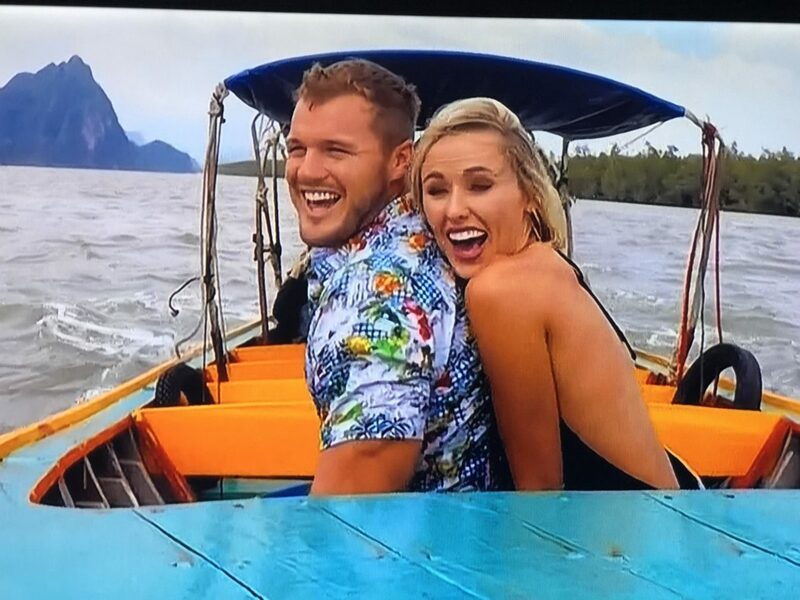 In Part 1, Heather and Colton gave off some serious Little Mermaid vibes when cruising Thailand waters….and a lot of us found ourselves shouting/singing GO ON AND KISS THE GIRL! At one point, I was ready to take one for the team and just kiss her myself. 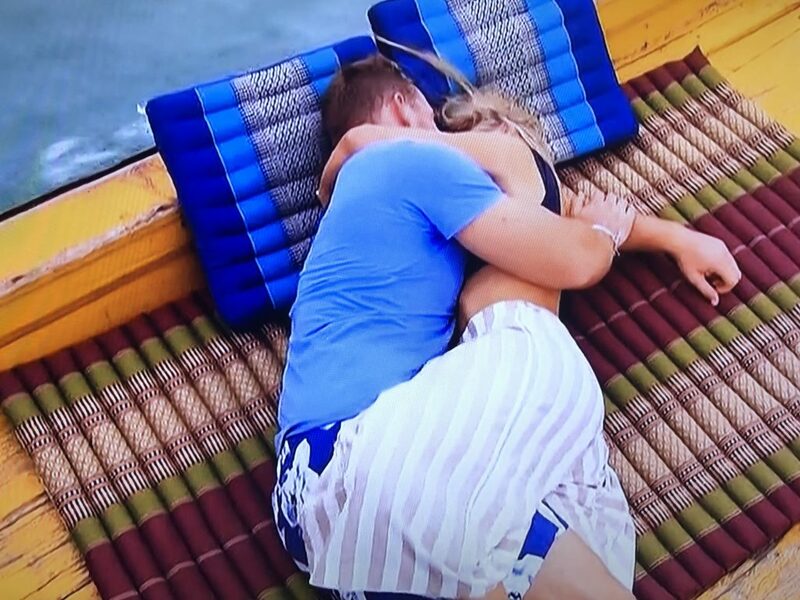 I’m telling you it took WAYYYYYYYYYY TOOOOOOOOOOOOOO LONNNNNNNNNNNNNNG for Colton to finally kiss her. This was me, channeling my best Sebastian. 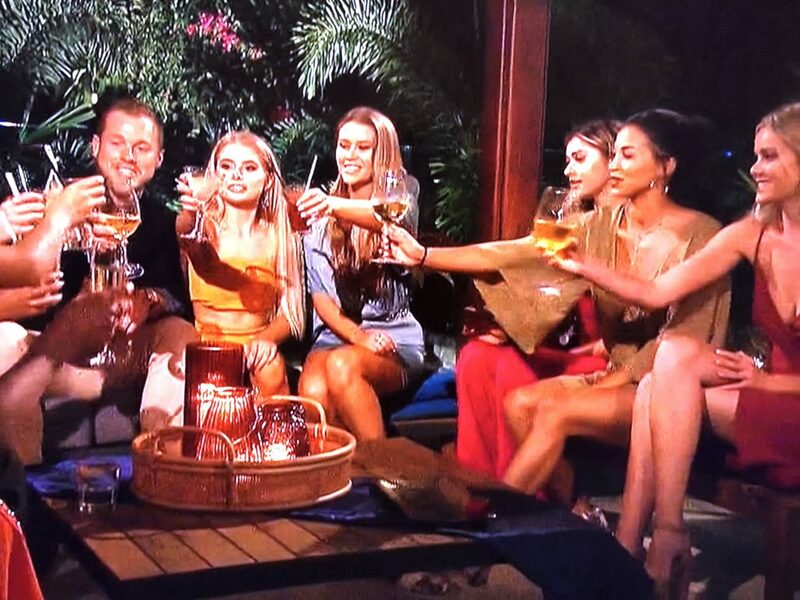 We pick up today with Colton and all of the jungle girls heading to the evening portion of their group date. Colton was excited and hoping it was going to be drama free. Lol. Bless his heart. 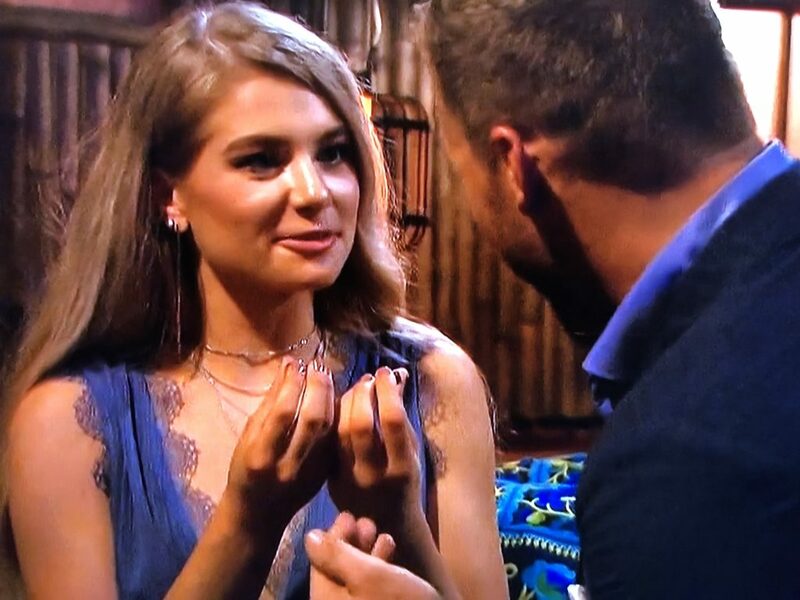 Colton immediately took Tayshia aside to thank her for pulling him away for a little 1:1 time in the jungle. It meant a lot to him, and he wanted to thank her for making him feel special. He though the best way to do that would be to take her to the beach and stick his tongue down her throat. Mission accomplished. Next up, Miss Alabama Hannah said she wanted to “completely jump off the cliff” and she needed to “show him what love looks like with Hannah.” Awesome, I love it when people talk about themselves in the third person. She got all up in his personal space and admitted she had been struggling because of her love for him. 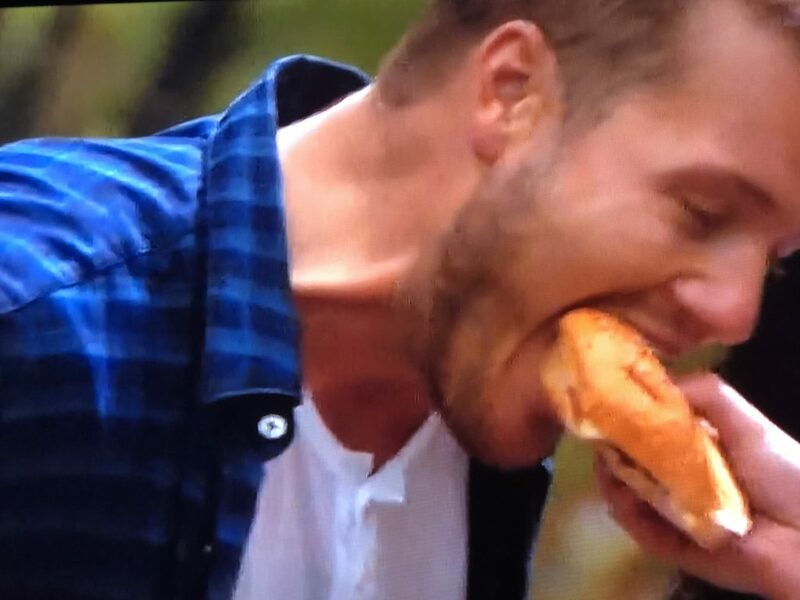 She said, “Ummmmm, I am falling in love with you.” And Colton ATE. IT. UP. Cut back to the girls. 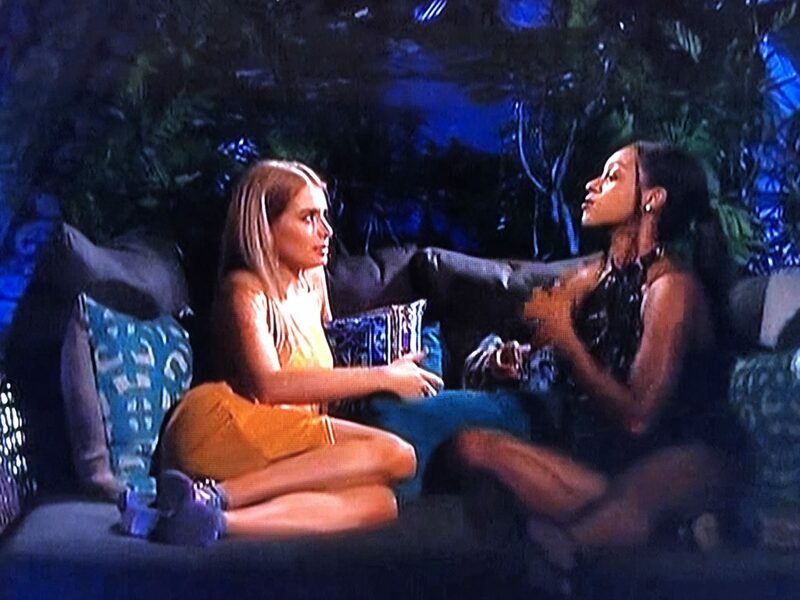 Onyeka took Demi aside and shared with her that before Elyse left, she told Onyeka some things about Nicole that Colton needed to know. I was rolling my eyes SO HARD. Onyeka actually said “I hate being that person to be bringing up something he doesn’t want to hear.” Raise your hand if you believe that. Bueller. Bueller. When girls set out to talk to the guy about another girl, normally I’m shouting “No, don’t self destruct!” at the t.v., but I have no feelings of affection for Onyeka, so I didn’t care if she crashed and burned. No skin off my back. All I needed was some popcorn and Junior Mints. 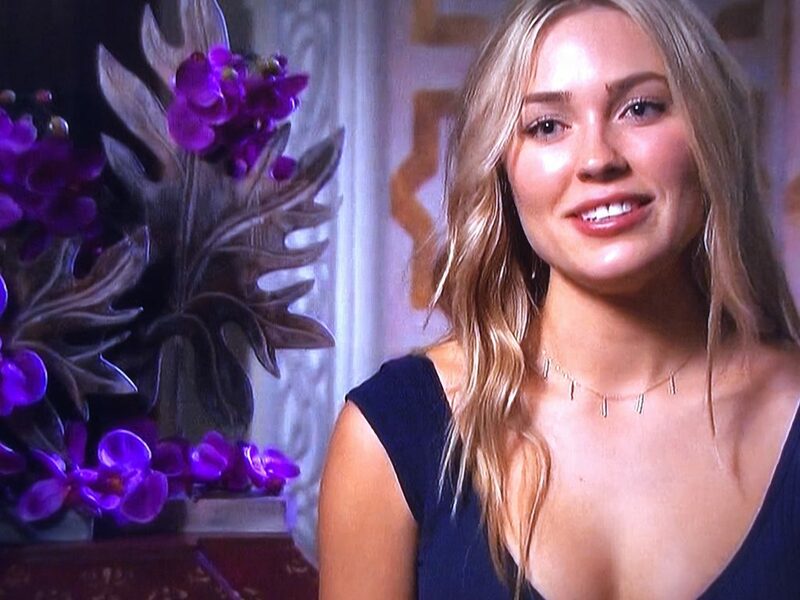 She sat down with Colton and told him that Elyse said that Nicole said she was on The Bachelor so she could find an opportunity to “leave Miami“. And Onyeka put the air quotes around “leave Miami” a la Joey. Not using it right, Joe! It was a puzzling use of the air quotes to say the least. After hearing Onyeka out, Colton then did what Colton does best. He immediately grabbed Nicole to get the bottom of it all. I love that he cuts out all the bull and always goes straight to the source. He told Nicole that Elyse told Onyeka that Nicole was doing the show just so she could leave Miami. Is that as clear as mud? Nicole seemed to be just about as confused as I was. Let’s pick this apart shall we. First and foremost, who would want to leave Miami? Nobody. Certainly not our little Cuban hottie. Nicole explained to him that she was not there for fame or to escape Miami, but only because she had experienced trouble finding love. Plain and simple. Back with the girls, Onyeka couldn’t wait to tell them all what she had told Colton. 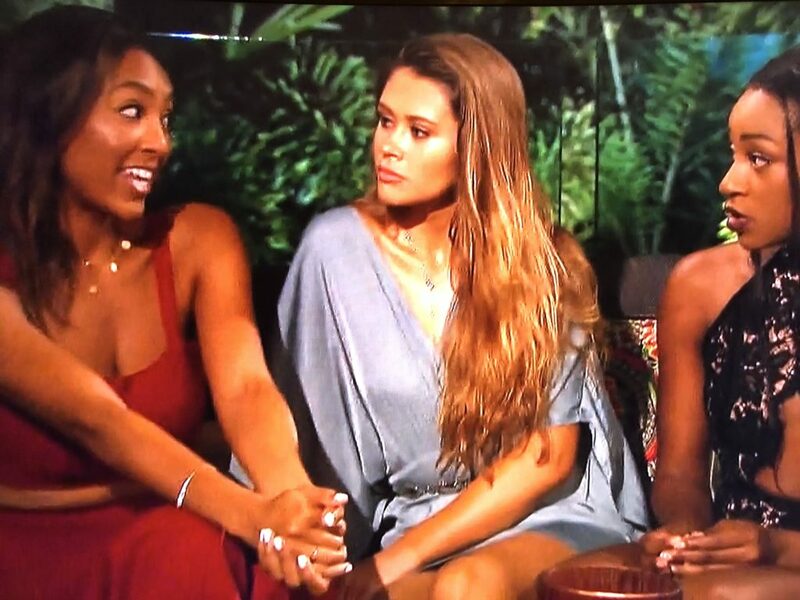 And Tayshia was like “Well, that’s awkward, because I was there for that conversation and Nicole didn’t say that at all.” Tayshia explained that what Nicole actually said was that she liked to take opportunities that could change her life. NOT THE SAME THING, ONYEKA. Onyeka was all “Well that’s what Elyse said. She had to have believed it in her heart, or she wouldn’t have said it.” HUH? And then she inexplicably used the air quotes again. Still wrong, Joe. 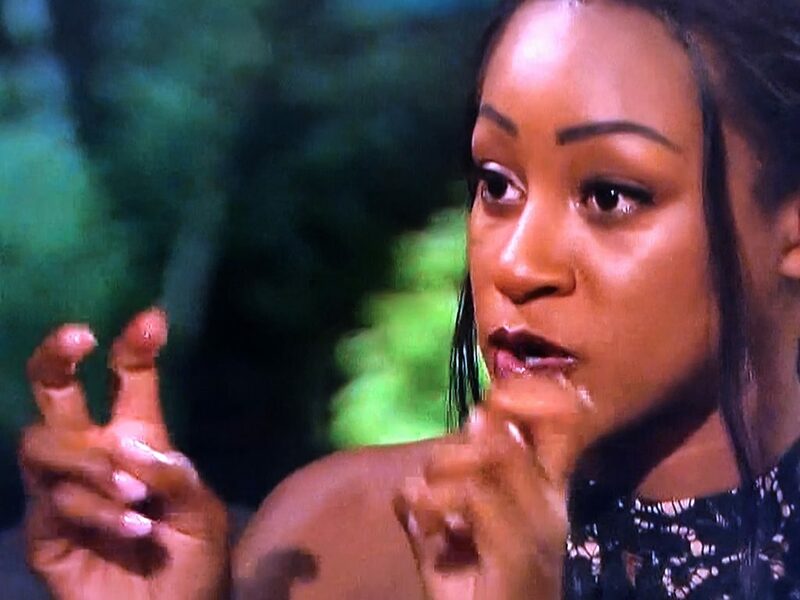 Tayshia didn’t back down. She called Onyeka out on it and just flat out told her she was wrong. Onyeka then tried to act like “it freaked her out” that Nicole had said that. WHAT-EV-ER!!!! Take some ownership Onyeka. 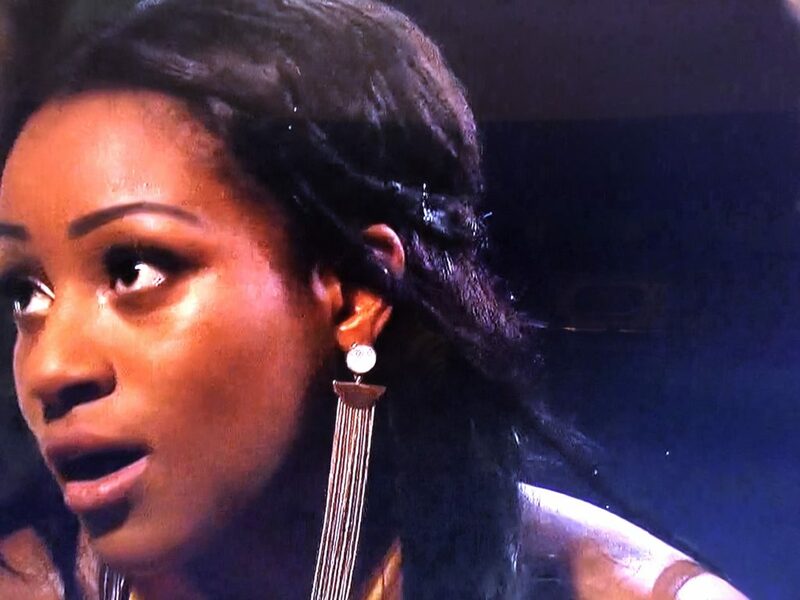 Nicole walked back to the group (after speaking to Colton) and expressed the fact that she was displeased with Onyeka. That’s what a rumor is, Onyeka. And even though she was called on it, she didn’t apologize. In fact, she doubled down. Here’s what we learned from this whole little game of telephone. Tayshia is awesome. 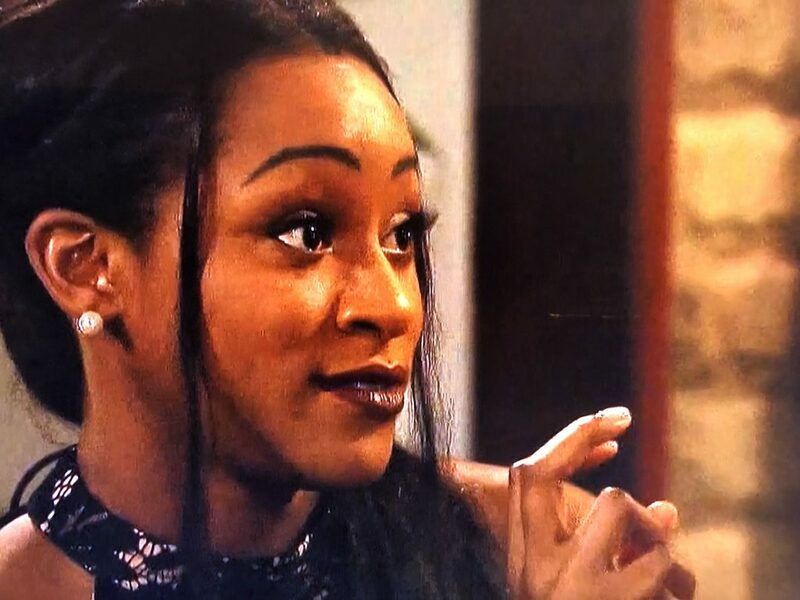 She not only stood up for Nicole, but she did it in a respectful way. I’m a fan. Back at the house, Finally Been Kissed Heather and Cassie were having girl talk about what Cassie’s 1:1 was going to be like. Cassie provided a bit of foreshadowing when she said “intimacy and physical touch are important“. And she meant it y’all. Cassie, I’m looking for love deeper than the sea. It’s time for Cassie’s 1:1! Come on, Cassie! Curl your hair, dab on some lip gloss, and grab your Goldman Fristoe-3 on the way out the door. She was rocking some of that delicate gold jewelry that I talked about yesterday, and it prompted me to order this necklace. They hopped on a boat and started their make out fest there. Where was their floating bedroom headed? A private island in the middle of the ocean!!!! To me, it looked like less of a private island, and more like just a big ol’ pile of sand surrounded by water. Just for sake of argument, a private island should have some sort of shaded covering. And/or a palm tree. And/or a cabana boy. And/or pina coladas. Or any combination of the previously mentioned island things. So they made out a lot. And he grabbed her hiney. A lot. And don’t worry, they took their make out sesh to the ocean too. I will say that the “PRIVATE ISLAND” (take notes Onyeka, that’s how you use air quotes) provided plenty of square footage for making out. And make out they did. 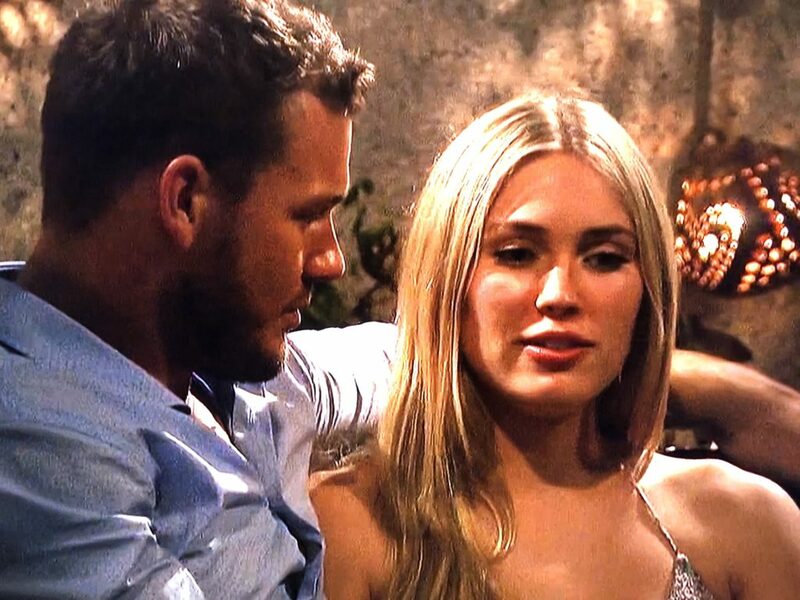 That night, Colton toasted to the beginning of something very special, and it was more than obvious that he digs her HARD. And it was obvious that she digs him too. HARD. She then thought it was necessary to discuss with him that she is NOT a virgin. She said it was hard to talk about because some members of her extended family and her community might judge her for it when they found out. Quite frankly, I didn’t understand why it had to be a conversation on their first date. On National t.v. In front of the world. He said he was proud of who he is, but he didn’t judge her. They retired to a bed somewhere, in full outfits. 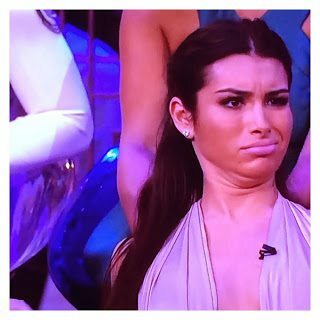 Colton said, “I don’t normally allow ladies in my bed on a first date, but for this case I’ll make an exception.” And then they made out, under the covers, fully clothed. I’m going to go ahead and assume that they had their shoes on. She got the date rose. 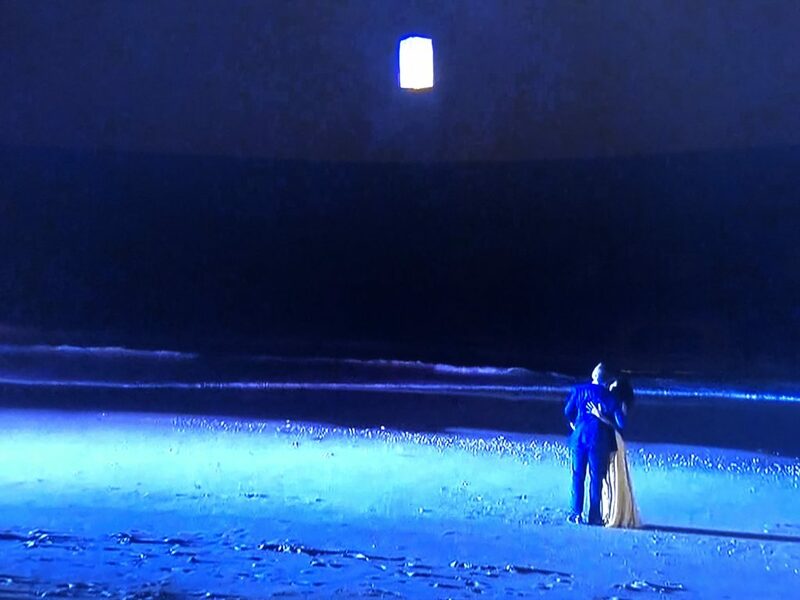 Tayshia took him down to the beach and they lit and let a Chinese lantern go, but not until they both made wishes. 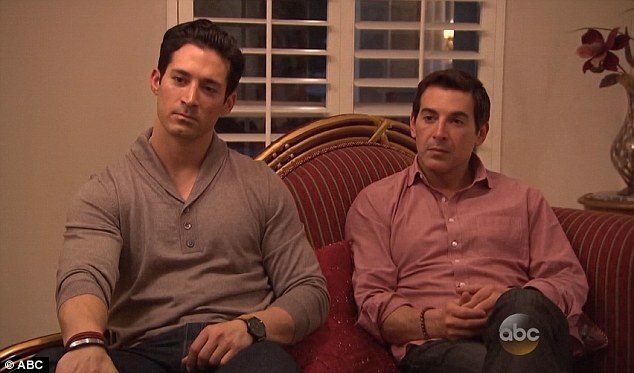 Colton wished “to continue to grow our relationship stronger each and every moment. And to taking advantage of the little moments, because sometimes those mean the most.” That was a solid wish that was totally off the cuff. And then they let the lantern go. It was pretty magical, if I do say so myself. Demi took him aside and gave him a trust ring. And then they made out. I was hella confused, until I remembered that she’s a dental hygienist. 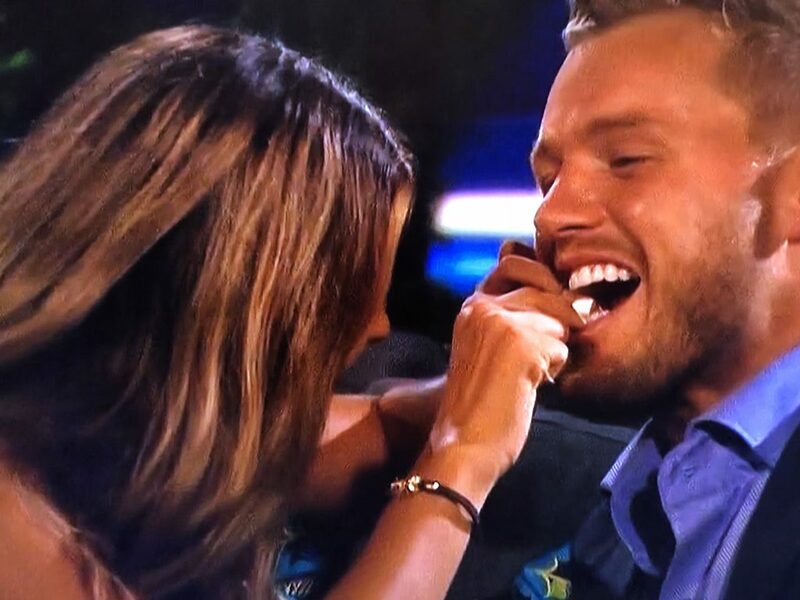 Still, I think it’s just good etiquette to not floss somebody else’s teeth on a date. In fact, I’m going to go a step further and venture to say it’s not proper etiquette to floss your own either. I’m sure Emily Post would agree. He sat down with Nicole. She wanted to make very sure that he understood that she is truly there for love. I totally understood her wanting to stand up for herself. 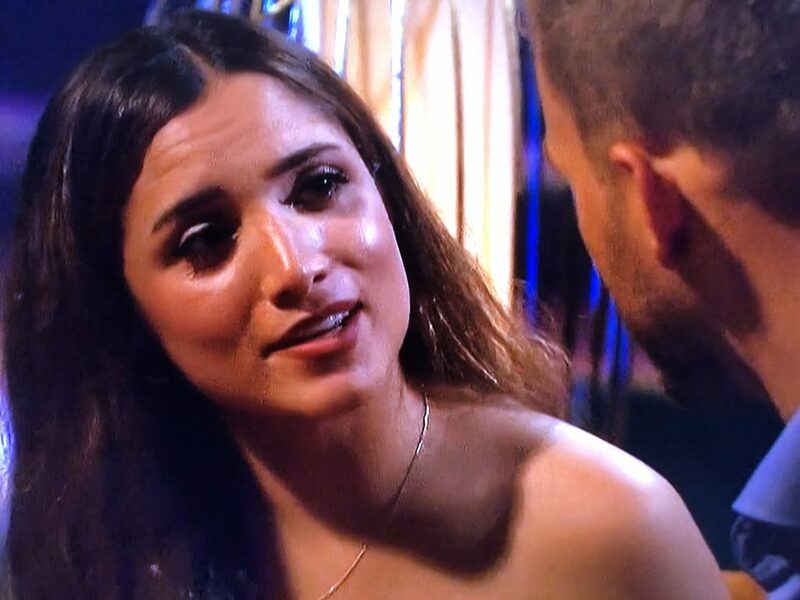 Nicole did come off as a bit of a tattle-tale and awfully whiny, but I do think there was plenty of truth to what she was saying. Across the way, Onyeka continued to defend herself to the other girls. She was so self righteous and it seemed to be that she’s one that will never admit when she’s wrong. Which is a total turn off. It’s okay to mess up, but just admit when you’ve done so. Instead, she doubled down. Not a trait I would want in a life partner. And let’s remember, this was the girl who had the blow horn at the beginning of the show. 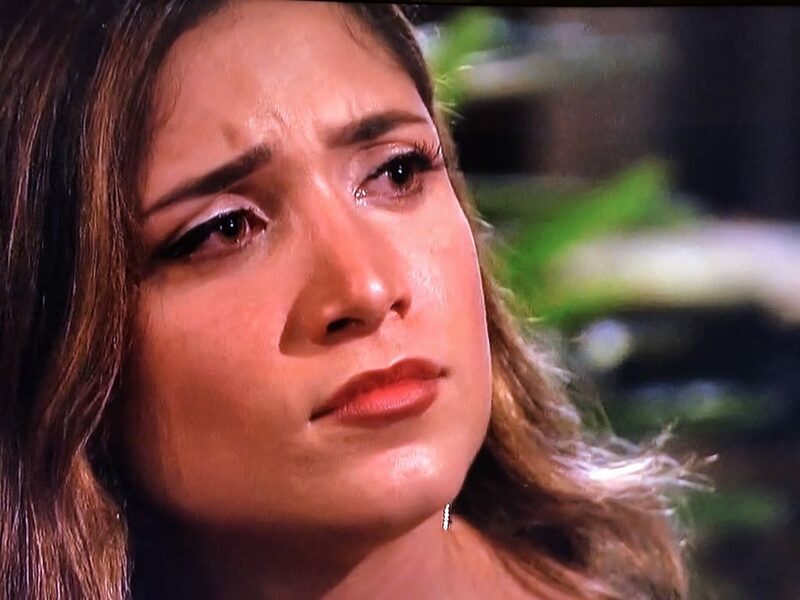 When Colton called her on everything, she said she would never in a million years call somebody mentally unstable… but in the next second she did call Nicole a psycho. And then she said she had never in her life been called a bully… but it the next second she said “I am a very nice person. But if you are going to come at me, I can come at you 10x harder, and I can say some stuff to tear you down.” Sooooooooo, there’s that. JoJo’s brothers do not approve of Onyeka’s bullying ways. Then Onyeka asked Nicole if she could talk to her. And Onyeka’s true colors came out. She was downright mean and hateful to Nicole. She had this air of superiority that made me crazy. And although I thought Nicole was engaging too much and being whiny, it was obvious to me that Onyeka was the crazy one in this situation. 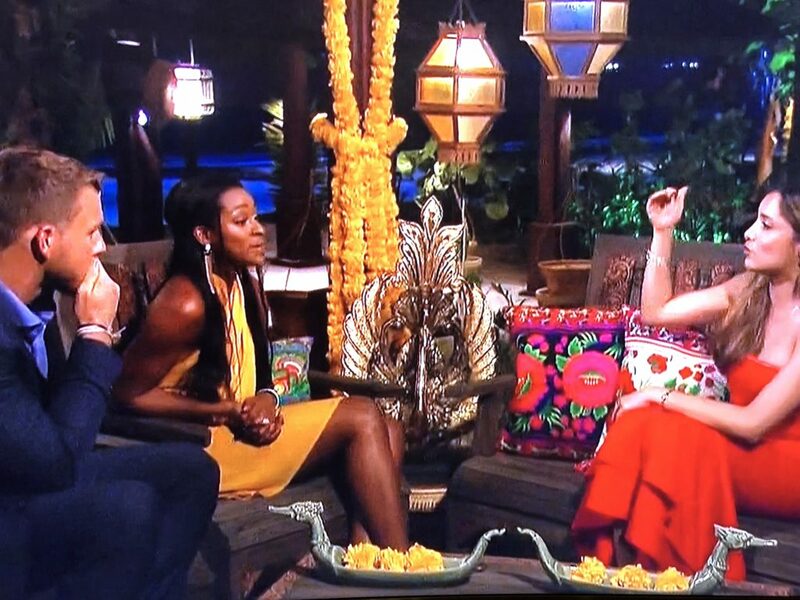 Colton was sitting with a girl (I literally don’t know what her name is) when he heard the back and forth between Onyeka and Nicole. So he headed over to them. They continued to go at each other. And then Colton just got up. He’d had enough. And I couldn’t blame the man. Onyeka ran after him. She caught up to him, but Colton said he needed some time alone. 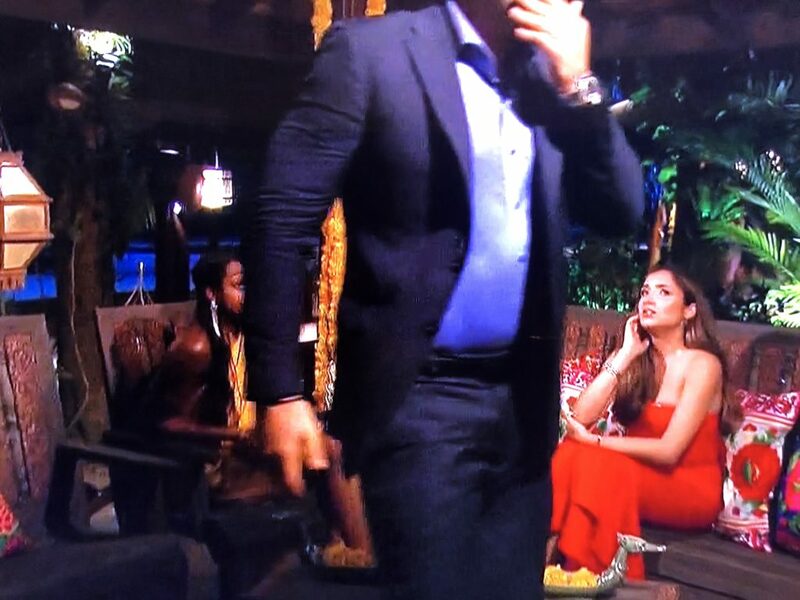 And then he walked by Nicole, she tried to link arms with him, and he walked away from her too. AND FOR THE RECORD. Had there been a 10 foot wall in the tri county area, I feel sure that Colton would have scaled it. In a single bound. For the first time this season, they gave the ol’ TO BE CONTINUED. Let’s not make a habit of this, ABC. Before you go, let’s talk sandals. These were my 4 most worn pairs of shoes last summer. And great news! 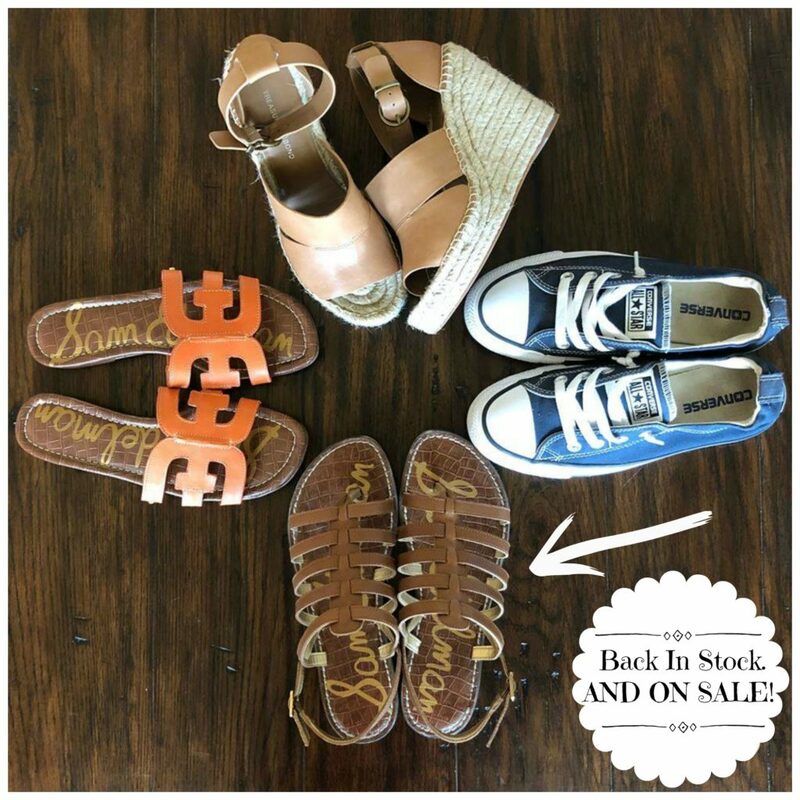 They brought the wedges back, and the converse never left. 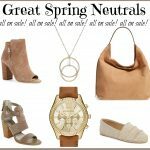 And yesterday I found the brown flat sandals and the orange slides BOTH ON SALE FOR AMAZING DEALS (and I thought that they were both gone forever)! See y’all back here tomorrow! I’ve got lots of great stuff to share! Soooo funny, friend! 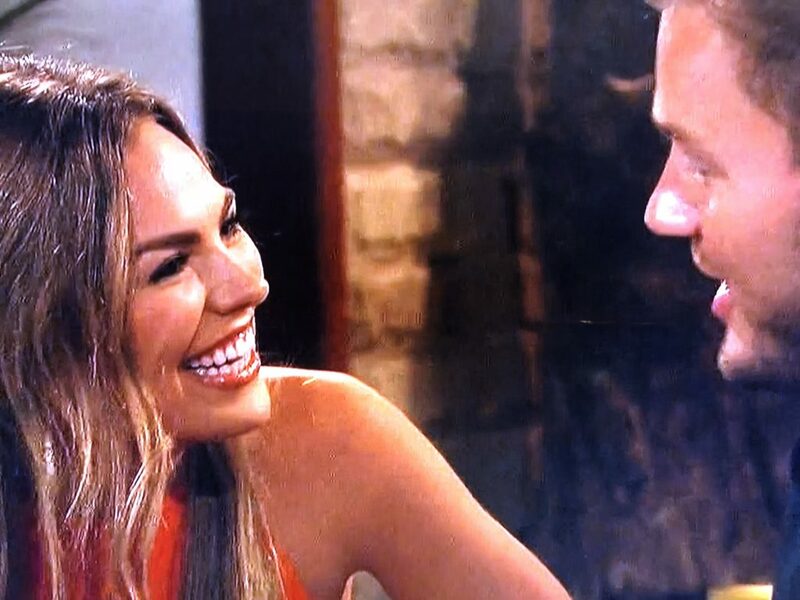 Love your recaps so much! 😂😂 that picture of the makeout locations, with key, was priceless! And Shay you are spot on! And the boat that took them there.😳. It looked like they threw some used lounge chair cushions on a rotted wood floor. 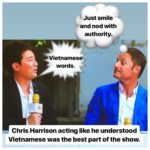 This recap was pure gold! You are so funny! Can’t wait for next Monday’s episode and the subsequent recaps. Have a great Thursday! “I’m going to go ahead and assume they had their shoes on.” I about died! I was totally troubled by the lack of amenities on the private island…no snacks…no bathroom… Has the show ran out of money??? 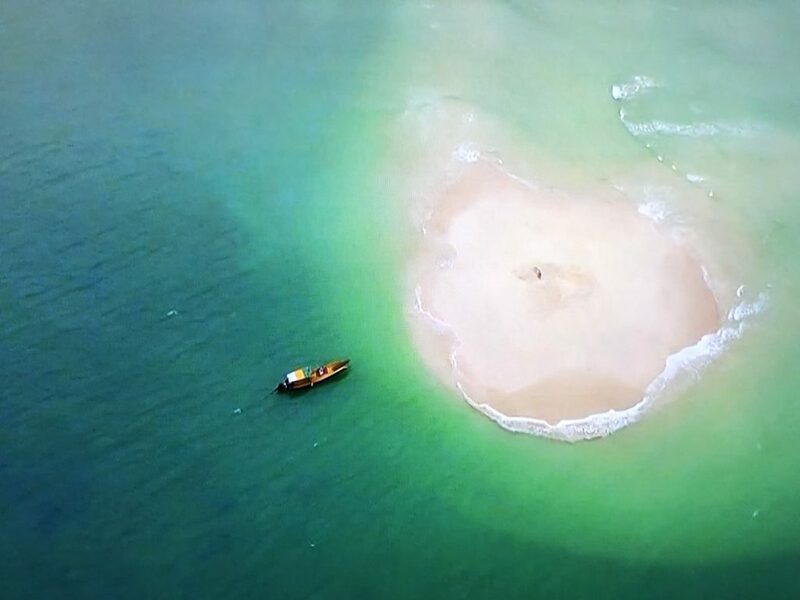 Was I the only one who thought the “private island” seemed a little dangerous?! I felt like they were one wave away from being swept out to sea in what I’m sure are shark infested waters! Did anyone else panic when the boat pulled away from the “private island”? Like where was the bathroom, what was I supposed to eat, sit down, dry off with??? No thanks ABC. I need a few creature comforts. I stopped watching the show, but read your recaps. Spot on, as usual and so hilarious, Sheaffer! You are so terrific at reading characters! I agree with Shay re the private island! Yikes! I hope the skiff was close by to rescue them if the tide returned! 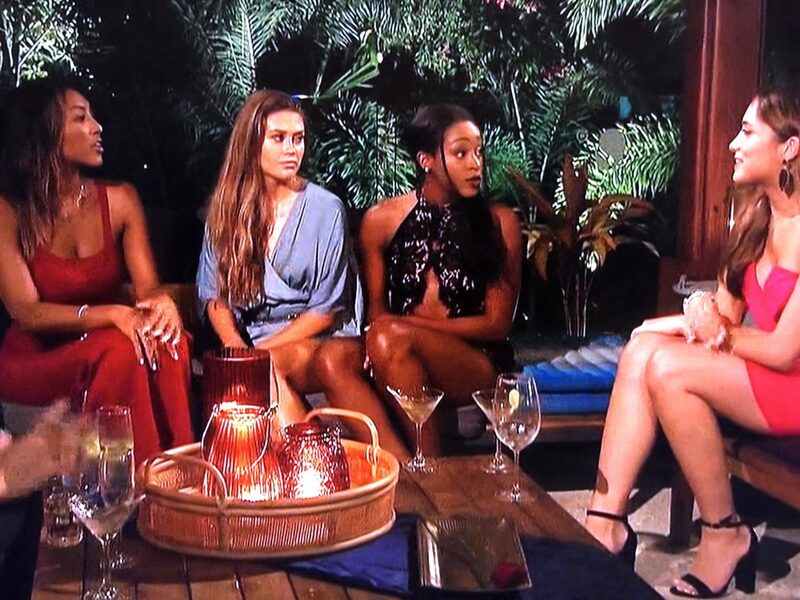 Final four, in my op: Cassie, Hannah G., Tayshia and Caelynn, with Cassie with the ring on her finger, in spite of all of the pub re her previous reality show gig! Read her former, long-term boy friend’s statement. He sounds like he’s a very nice guy. Seriously, WHAT is that girl’s name though?! 😂😂😂 When Colton walked away from her to go sit in on Onyeka and Nicole’s loud discussion I was so distracted with nothing but “Who is THAT? !” thoughts. And Onyeka should have been let go a long time ago. That girl seems like A LOT to take on a daily basis. I TOTALLY agree, Amanda!!!!!! Seriously. Who was that? 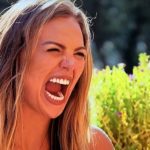 I’ve never posted a comment but wanted to tell you that your Bachelor recaps are amazing!! They’re so fun to read… thanks for taking the time to write them. Buying the necklace you posted similar to Cassie’s. I appreciate the Blocker Breaks, too! I’m assuming before Cassie administered the GFTA-3 she found that his oral musculature was within normal limits. One must document. Thanks for all of the hilarious updates. 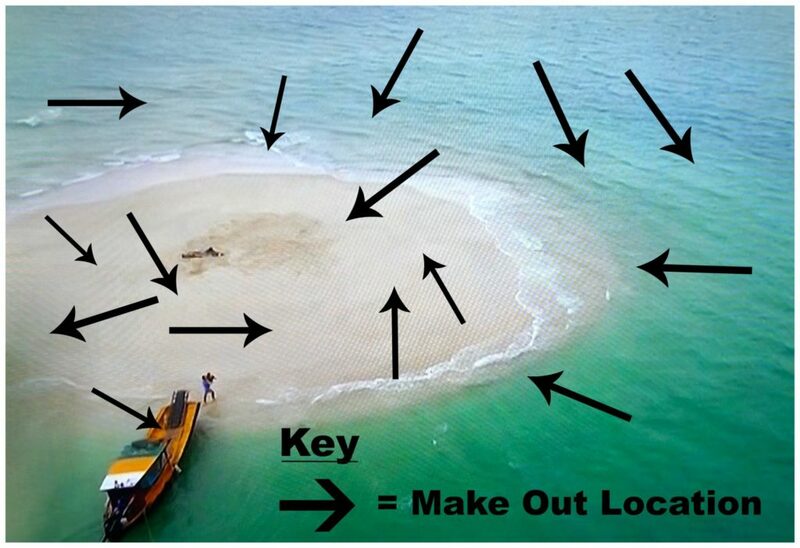 It’s a sandbar….not an island, which appears at low tide!